This series of guidebooks draws on the practical knowledge that the Center for Creative Leadership (CCL) has generated, since its inception in 1970, through its research and educational activity conducted in partnership with hundreds of thousands of managers and executives. Much of this knowledge is shared-in a way that is distinct from the typical university department, professional association, or consultancy. CCL is not simply a collection of individual experts, although the individual credentials of its staff are impressive; rather it is a community, with its members holding certain principles in common and working together to understand and generate practical responses to today's leadership and organizational challenges. The purpose of the series is to provide managers with specific advice on how to complete a developmental task or solve a leadership challenge. In doing that, the series carries out CCL's mission to advance the understanding, practice, and development of leadership for the benefit of society worldwide. 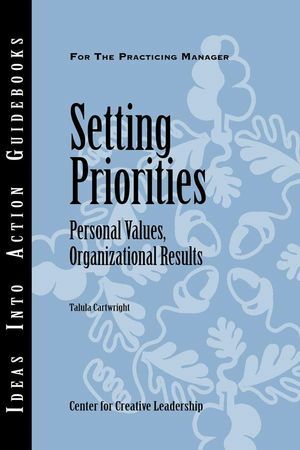 We think you will find the Ideas Into Action Guidebooks an important addition to your leadership toolkit. Talula Cartwright is a senior faculty member at CCL's Greensboro campus. She is a trainer in several open-enrollment programs, and designs and delivers custom programs for clients in the corporate, private, and nonprofit sectors. A certified feedback specialist and executive coach, Talula holds an Ed.D. in higher education leadership from the University of North Carolina at Greensboro.